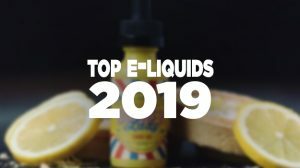 Joyetech has always been viewed as an outstanding company. 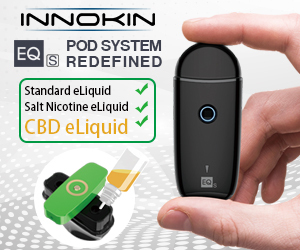 They’ve created a solid track record for themselves, and have become a legend within the electronic cigarette industry – mostly due to its consistent, inventive and very high quality products. What typically separates Joyetech from the rest of the manufacturers is the quality and always sleek, yet simple design. 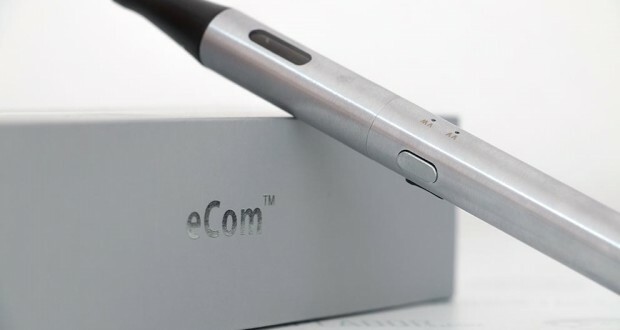 The latest product – which received a 2014 Red Dot Award for Product Design – follows along the same lines, beautiful, sleek, elegant and simple – all describing the Joyetech eCom. The Joyetech eCom looks absolutely beautiful. 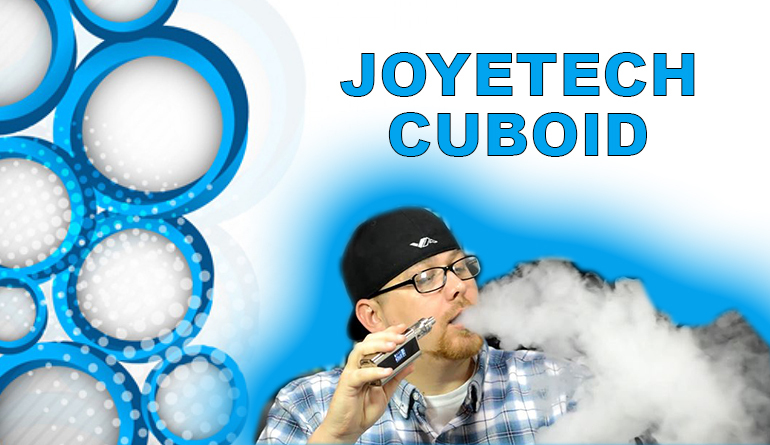 It’s sleek and simple – which describes many of the Joyetech products on the e-cigarette market currently. Joyetech has always went with a “simple” approach, which has worked flawlessly. 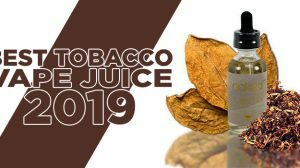 They don’t over or under design any product, and I believe placing themselves in that medium has continuously kept them as a leading manufacturer of electronic cigarettes. Starting from the top, there is a detachable mouthpiece that unscrew’s from the clearomizer portion of the eCom. Located on the base of that mouthpiece is a rectangular hole that supplies the airflow. 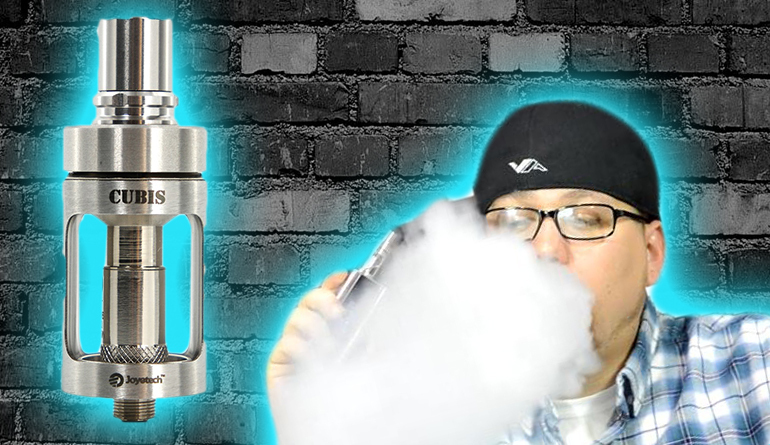 Just below is the stainless clearomizer that supports the Joyetech original C2 Atomizer Head. 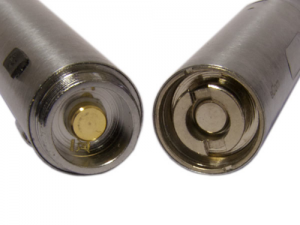 Located on the clearomizer and below the rectangular inlet is a round air outlet, which is said to be designed in such a specific way to eliminate the possibility of leakage. Moving further down the clearomizer is a transparent window to view the current e-liquid level. 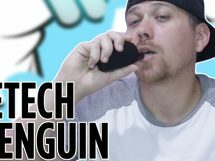 – In all honesty, it looks as if it’s the Joyetech eGo redesigned, reconfigured, and with a more modern appeal. I like the way the eCom looks, it’s very appealing and I can’t help but to think this device was created to recapture that audience that enjoyed the original eGo so much. 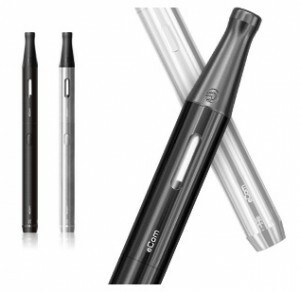 Back when the eGo-C Twist was released, it gave the eGo series a breath of fresh air and rejuvenated the eGo’s branding. And now, I feel as if Joyetech revised that same eGo size and reinvented what a medium range device is supposed to look like. I can see why the eCom received such an award for the eCom, because there’s no doubt that this device is a pleasure to look at. Though the eCom may offer a simple appearance, it isn’t your typical simple device. The eCom has many cosmetic features, as well as advanced functioning features also. Let’s first begin with the cosmetic features of the eCom and then make our way to the functional features. Cosmetic Features: The eCom makes use of a screw-able mouthpiece instead of a standard 510 drip tip inlet. Though I’m not too pleased with the use of this mouthpiece, it is however necessary for the functional features beneath it. 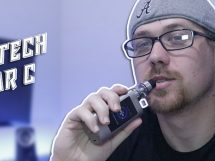 To make up for the mouth piece that comes with the eCom, Joyetech made a small metal piece that screws into the clearomizer and allows the user to insert any 510 drip tip. 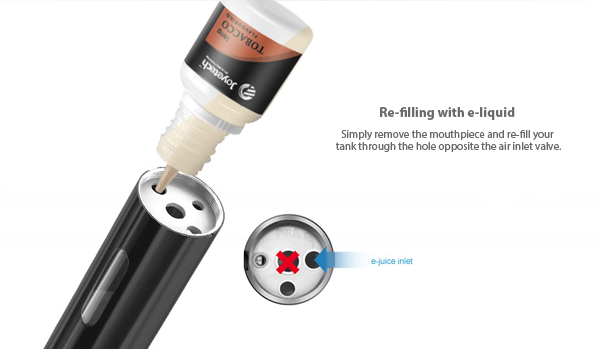 I love that Joyetech thought of this and it adds to both cosmetic and functional features of the eCom. 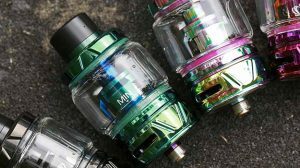 The transparent sight window located on the clearomizer was a must since it allows the user to view current e-liquid levels. Once the eCom’s button is pressed and activated, a white LED will glow around the edges of the button, letting the user know that the battery is being activated. In addition to indication, both the “VV” and “VW” LED holes light up to indicate which mode the eCom is currently in. The micro USB port that gives the user the ability to charge the device internally is a great feature, but the black rubber seal will get in the way and making you mistaken it for the button – which is a small annoyance. There is an easy solution for this however – which is simply removing the seal completely, but allows dust and debris to enter that port. 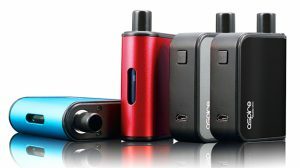 Continuing, the eCom also comes with variable voltage and variable wattage, which has been separated into two modes. These modes can be switched by pressing the button 5 times to power the device off. Once the device is off, press and hold the button for 1.5 seconds (takes around 3 seconds for me) or more and the indication light will switch to another mode (modes mean variable wattage and variable voltage). Repeat the process to switch back to the previous mode. Aside from the large amounts of vapor I’m able to produce from the eCom, the device’s overall performance is great. There is a slight exception however – that of the wicking abilities. The eCom’s clearomizer on start-up wicks exceptionally well, but chain vaping didn’t quite hold up. I often found myself taking a few dry-pulls to reinstate both the flavor and vapor, and that becomes a hassle over a lengthy period of time. The variable voltage and wattage is nice, and it ultimately made this device vapable for me personally. I can some-what deal with the wicking issue because the atomizer head allows me to produce so much vapor, so placing the eCom at a voltage I’m normally using anyways was a huge plus. If I could change one thing about the eCom, it would be the top connection of the battery tube. With the way it’s designed, it doesn’t allow you to use any other clearomizer except for the clearomizer that came and was made for the eCom. Options is a big plus for me, and it defines this industry, so not designing the eCom as a universal battery was a big flaw in my eyes.